We all know how important automation is for the delivery of IT services. And a self-service provisioning, the key feature of the cloud, comes hand in hand with automation. But many customers, even those who already have vRealize Automation in their environment, don’t know where to start or how to move forward in the most effective way. If you are one of them, this webcast is for you. Through practical demonstrations, whiteboards, and technical tutorial, we will show you how to quickly become the automation guru in your team! 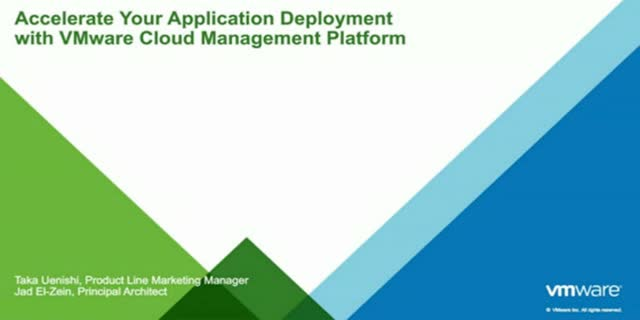 During this session a VMware Cloud Specialist Engineer will show you how to install and configure vRealize Operations (vROps) to quickly make it functional within your environment. We will begin with a brief review of the vRealize Operations Architecture and its different server configuration options. To wrap things up we will review the user environment and how to start using vROps to proactively manage your environment. Looking to solve the puzzling visibility gap across the virtual and physical network? Trying to find the elusive answer to ensuring health and availability while also enhancing security and compliance? Need to deliver faster time to value? See how you can quickly and easily design and deploy micro-segmentation across the network with an intuitive and easy-to-use UI with natural language search. Optimize network performance and availability with visibility and analytics across virtual and physical networks. And get troubleshooting and operational views to quickly and confidently manage and scale VMware NSX deployments. This session will provide you an overview of vRealize Network Insight (vRNI) product and capabilities. Want to take vRealize Operations to the next level by integrating with ServiceNow, PagerDuty, Slack and more? You can do that! Join us to learn how easy (and fun!) it can be to explore using vRealize Operations extensibility with two powerful features. First, we will cover how you can use the REST Notification plugin in to send alert information to practically any system with a Web API including vRealize Automation and vRealize Orchestrator for ultimate automation power. All possible with Webhook Shims, an open source project available today. Next, we will take a look at the vRealize Operations REST API to discover how you can perform many different tasks without even opening the UI. This includes using PowerCLI for tasks such as looking at stats, alerts, object properties and more. If you want to know how vRealize Operations can feed and interact with other IT tools in your environment, this session is for you! In this session our DevOps engineering expert will provide a demonstration of the vRealize Code Stream Management Pack for IT DevOps (vRCS MP), a.k.a. Houdini. This product allows the Cloud Admin to design, test, and execute DevOps processes for Software-Defined Infrastructure content through continuous integration/delivery (CI/CD) process. By adding Content Endpoints into the vRCS MP such as vSphere, vRealize Automation/Operations/Orchestrator content (metadata) can subsequently be captured and versioned in the Xenon Repository, tested in a staging environment and then released to the target (test, staging, or production) environments in a single request. Would you like to deploy agents on post provisioning? Orchestrate and automate service delivery? Take advantage of existing CM tooling? This webcast builds on previous sessions where we introduced vRealize Orchestrator and the new Event Broker Service. In this session, we will explore advanced use cases; XaaS, Blueprints and Event Broker best practices; and how to extend the solution to solve common challenges. Join us to learn how to more effectively utilize VMware vRealize solutions to quickly get the most value from your VMware investment. During this session VMware Cloud Specialists will dive into Best Practices for what to do next on Day 3 in vRealize™ Operations™ 6. First we will review in this session, Day 2 Operations, the major concepts learned from Day 2, and then continue to build on, into Day 3. - Adding SDDC Management Packs to the environment. - Modeling an Application and its Tiers to be managed. - Review the Alerts and Systems for Container objects to insure that alerts are bubbling up correctly to Application container objects. - Build a Maintenance Schedule to suspend alerts from trigger for the application and its objects. - Building a Dashboard to visualize the managed application. - Assigning the Dashboard and its application objects to the appropriate roles. - A feature walkthrough how to navigate, drilldown and isolate a problem in the newly designed application. The more apps that benefit from server virtualization, the better. But when they’re mobile or big data apps, can you still guarantee performance and do it cost-effectively? It’s not easy when siloed operations and disparate management tools get in the way. As your virtualized infrastructure grows, vSphere with Operations Management can help. Its advanced hypervisor technologies support new app requirements, while minimizing operational complexity and cost. •Virtualize any app with confidence and make better decisions on workload placement. •Automate operational intelligence and gain consistency in management. •Reduce waste in overprovisioning and reduce the costs of compliance across VMs. Don’t miss it! This technical deep-dive will show you how to keep up with performance and high availability for all your cloud-based, business-critical (SaaS), and mobile apps. Intelligent Workload Management has arrived! VMware vSphere with Operations Management 6.1 delivers several exciting new features that will save you time, optimize your resource utilization, and provide proactive visibility into your data center operations. vSphere with Operations Management delivers a robust virtualization platform with critical capacity management and performance monitoring capabilities. •Integrated OS and app monitoring. •Consistent operations management across the Software-Defined Data Center. If you’re still spending days to provision infrastructure services, or weeks to deploy applications, it’s time to turn automation on. Join us and learn how you can automate the delivery and management of shared services, infrastructure, and applications.